Few activities are as rewarding as the physical exploration of a personal hobby or interest, and for archaeological enthusiasts an increasing variety of opportunities to participate in fieldwork are becoming available across the country. 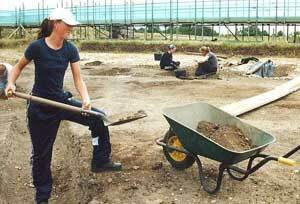 There is high demand each season for places on the expanding number of training excavations and field schools, as people from all backgrounds and professions swap their home comforts for knee-pads and a trowel, and start exploring the past for themselves. If you have been inspired to take your interest further by signing up for a field school this coming season, this Handbook will introduce you to the wide range of opportunities on offer. In order to help you get the most out of your experience, Mark Anderson offers the following guidelines to enable you to choose a project that meets your needs. A fundamental factor in your choice of field school will be its location. If you need to live at home, perhaps to look after a family, you will have to investigate opportunities available locally. But the ability to stay further afield inevitably opens up a wider choice of projects, and will enable you to take advantage of the lively social atmosphere that is often an element of residential programmes! If you are interested in residential field schools, it is important to find out about the domestic arrangements. Is accommodation provided? If not, you will either need to bring your own tent or arrange local B&B lodgings. Ask about the provision of food. Some schools provide three meals a day, while others will point you in the direction of local pubs and supermarkets. Bear in mind that the level of domestic provision will have a significant influence on the size of the fee payable for the course. The structure of training programmes will vary between projects, so it is useful to find out as much as you can about the content of an opportunity that interests you. The project organisers should be more than willing to answer your questions, and may be able to provide you with some useful literature about the courses on offer. In addition, 'unofficial' feedback from previous trainees can be particularly enlightening. Performing repetitive tasks on site, such as trowelling over a large area or scrubbing pieces of pottery or bone, is an inevitable element of field archaeology and you must be prepared to endure this kind of activity now and again. However, a structured training programme should be able to provide tuition in a range of techniques, and give you a chance to try your hand at different aspects of the craft. Try to get a course outline that lists the different skills you can expect to learn, and you may wish to know if formal accreditation towards diploma and degree courses is offered. The more formal the level of your tuition, the more important it is to learn about the background, skills and experience of the instructors. Do they have any formal teaching qualifications, and how much teaching experience do they have? Do bear in mind however, that teaching qualifications do not necessarily create effective teachers, and many highly successful fieldwork instructors have never had formal teacher training. The most insightful information in this regard may be offered by previous participants, so do try to speak to someone who has already received training on the project. All fieldwork projects, including training excavations, aim to fulfil certain research objectives in addition to teaching their trainees. You will be part of a team working towards those archaeological goals, and many projects hold regular meetings for the whole team to catch up on overall progress. Keeping up to date with developments in other areas of the site will help you to gain a fuller appreciation of your own contribution, and will offer an insight into the decision-making processes going on at a grander scale. Both novices and more experienced enthusiasts will tell you that participating in an excavation can be extremely rewarding at any level. My recent research indicates that the majority of archaeological fieldwork training organisations are successfully formulating quality programmes of tuition, and creating positive training experiences for their clients. It is certainly not only professionally employed archaeologists who are able to participate in useful archaeological research. Now is a better time than ever to invest in your own trowel, and take advantage of the opportunities available for you to make your own valuable contribution.